First Day of 2nd Grade? No Big Whoop. 2nd grade is no big whoop. Yesterday was Vance's first day of school and it came and went with none of the anticipation that the other years had brought. No tears, no tummy aches, or no need for special coins to keep in his pocket for good luck . He is an early riser, so getting up is never an issue for him, we had already met his teacher, brought his supplies to class, and organized them in his desk. Thankfully, he likes school. He was excited to see all his buddies at the bus stop, his friends at school that he had missed all summer, and even stopped by to say hello to his 1st grade teacher from last year. He even bought his lunch (pizza day! ), a first in our first-day traditions, so no secret lunch box notes from Mommy. Vance is a Second Grader! All the kiddos on our bus stop celebrated with ice cream sandwiches afterwards. Nanoseconds after that I had to chase Vance down to make him tell me about his day. "It was good. Can I go play now?" So again, 2nd grade? No big whoop. For him and for me. In this scenario, him not worrying means I don't have to worry which is a nice change of pace from a parent's perspective. I am overjoyed to see him so comfortable in his surroundings. What's it like for you? 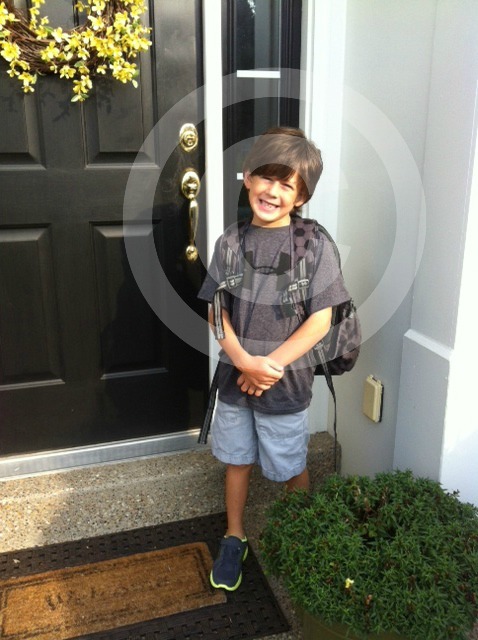 How are you handling your child's first day? P.S. If you're curious to see pictures of years past, here you go! I couldn't wait to see this year's picture. Love it!!! what's with the c in the middle? copyright? Glad he had a great first day...still can't believe he's a 2nd grader!